Enough preaching about self-deprivation.Â No more striving for bodily purity. Who has the patienceâor the time!âfor strict dietary restrictions and hours of meditation? Letâs get real. These tactics just donât workâat least not for long.Â But that doesnât mean health and happiness are unobtainable. Most often you just need an anxiety buster you can do while running down the street. Or a yoga pose you can do at your desk. Or a way to debloat what feels like an alien baby in your abdomen. Retox isnât about changing who you are or denying lifeâs pleasures. Itâs about tailoring sensible, scientifically-based health practices to the life you already live. Itâs about working hard, playing harder, and renewing your balance and energy so you can do it all again. 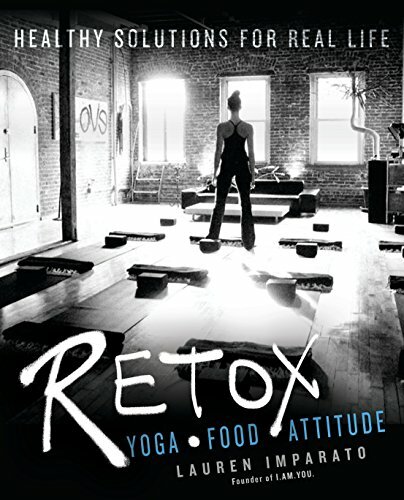 1 edition from Berkley Pub Group (February 2, 2016); titled "Retox: Yoga, Food, Attitude: Healthy Solutions for Real Life"
About: Practical health and wellness strategies from Lauren Imparato, creator of the I.